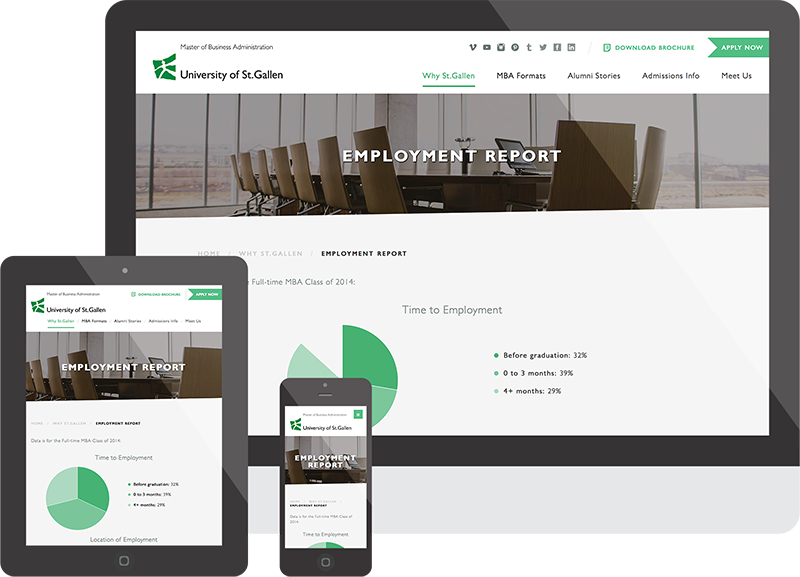 The University of St. Gallen’s MBA programs – now on a modern and sophisticated responsive website. 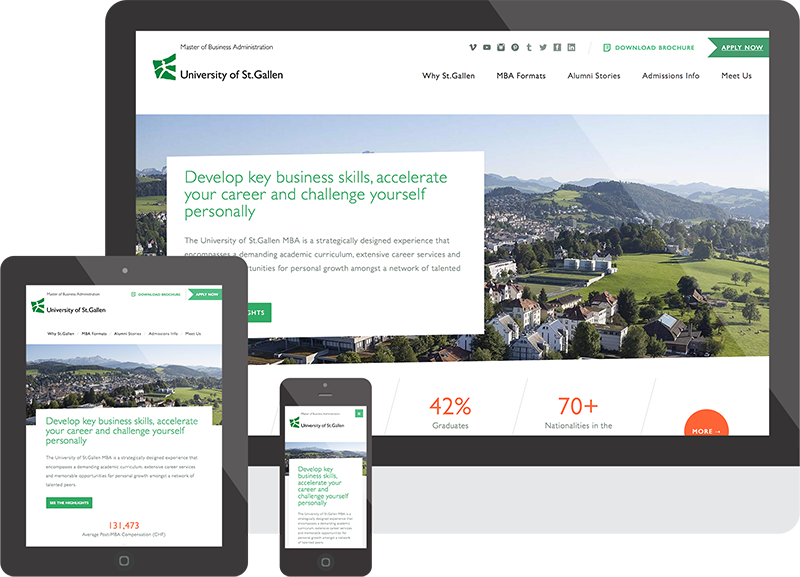 The University of St. Gallen commissioned us to design and develop their new MBA program website. 1. Statistical data regarding class profiles (nationality, age, etc.) and graduate employment (industry of employment, salary, etc.). Challenge: The data in the graphs needed to be presented attractively on all devices. Moreover, the MBA Team wanted to retain full control of the graphs, including the ability to create new ones. 2. The structure and learning outcomes of the MBA curriculum, career services and extra-curricular activities. Challenge: How to best display the full MBA program without overwhelming the reader. The MBA Team wanted to offer a brief program overview, with the option for readers to delve deeper into a specific area if it piqued their interest. 3. Alumni stories highlighting the various reasons why people had elected to take an MBA at the University of St. Gallen, including the specific benefits the program offered them. Challenge: To build a fully customized section that enabled website visitors to filter the database of alumni stories by the parameters that were relevant to them, such as nationality, industry of employment, gender and whether they were interested in a part-time or full-time MBA. A secondary goal for the new website was to create a contemporary design that was less cluttered with information than the previous version. 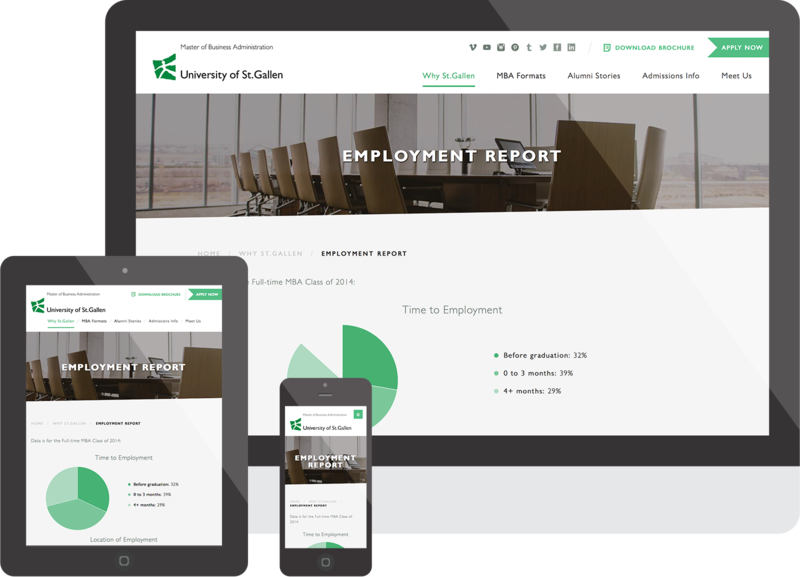 The MBA Team wanted the design to help build website visitors’ trust, reflecting the relevancy of the MBA program in today’s business age through the visual appearance and user experience. During the concept and design phases, our decisions were made based on the extensive user research prepared by the MBA Team. Our initial designs and prototypes were refined with usability tests. In our last iteration, we devised a solution that is both visually attractive and provides applicants and other website users with the information they require in a well-structured format. The new website was developed on a beta version of Drupal 8 in order to benefit from the latest technology standards. Drupal 8 offered the team greater flexibility and increased the speed at which complex functionality could be developed. The integration of responsive graphs is a particular highlight. Content editors can create attractive charts in a matter of seconds. A spreadsheet upload function in the admin interface imports the data into Drupal. The editor indicates the data range and the type of chart, e.g. a pie chart, and that’s all that’s needed to create charts. The University of St. Gallen is one of the most prestigious universities in Europe. Its MBA program started in 2005 and has achieved international recognition with top rankings in its class.